The developers made an undertaking to work with the Department of Housing, who they purchased the land from for over $18 million, to investigate affordable housing opportunities for the Department when the lots are developed. 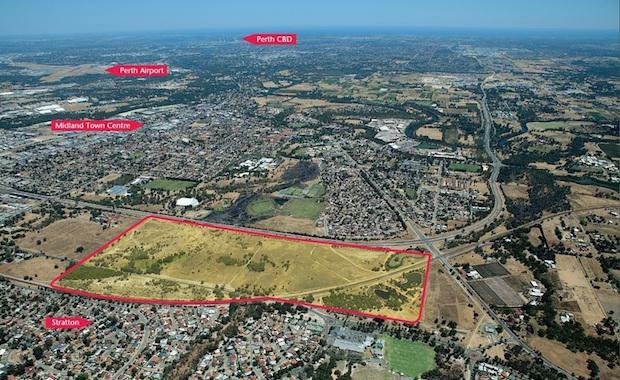 Zoned primarily for residential development and located close to the Midland town centre, the site is bounded by Roe Highway, Farrall Road and the Midland railway line. It is surrounded by existing residential development and community infrastructure and has the potential to yield over 600 residential lots. Knight Frank Managing Director John Corbett, who brokered the deal, said the site had attracted offers from several major developers, but Peet & Co and ABN Group had been the successful purchasers. “Both developers are widely experienced in large scale, residential sub-divisions and recognise the value of such a large land-holding within an already well developed residential area,” Mr Corbett said. “It is rare to get a large greenfields site so close to a major town centre like Midland where other residential communities and infrastructure are already in place. Knight Frank Residential Director Graeme Kiddey said the land-holding consisted of three individual lots at 50, 102 and 427 Farrall Road, Midvale. “There is currently very strong demand for englobo land which was evident by the number of offers received on the campaign,” Mr Kiddey said.